An early concept for an inflatable space station that made it into the production phase. 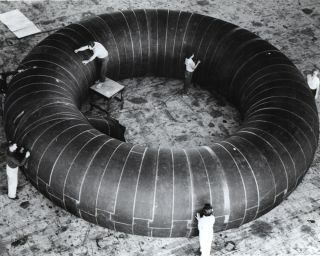 In this historic photo from the U.S. space agency, the inflatable station design, unlike many other early space station concepts, actually made it out of the concept phase and into production, as seen in May of 1961, though no models were ever flown. This particular station was 30-feet and expandable. It was designed to be taken to outer space in a small package and then inflate in orbit. The station could, in theory, have been big enough for 1 to 2 people to use for a long period of time. A similar 24 foot station was built by the Goodyear Aircraft Corporation for NASA test use. The concept of space inflatables was revived in the 1990s.